Every year, the cyclists that gather in Washington for the National Bike Summit meet with hundreds of Congressional offices to ask for expanded bike funding. This year, they’re just asking lawmakers not to cut it. 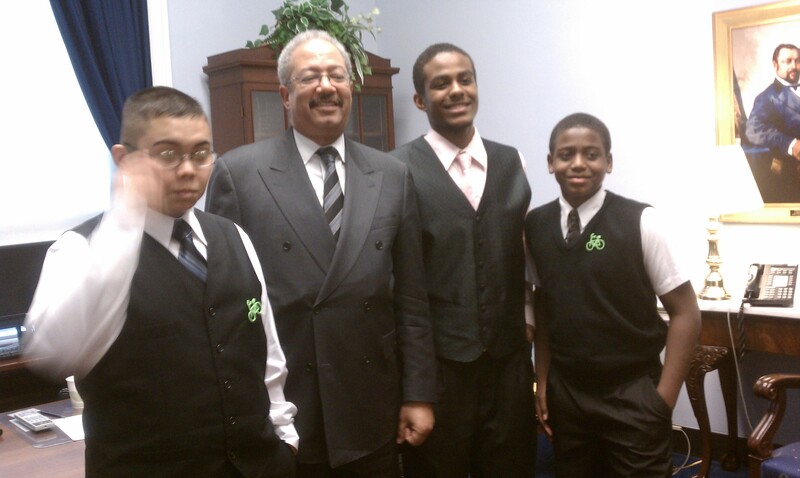 Congressman Chaka Fattah (D-PA) with teens from Neighborhood BikeWorks. Photo courtesy of Sarah Stuart. The ask. Lots of members of Congress will tell you how much they love biking. They’ll go on at length about how many miles they put in each week, how they ride to their district office in spandex, how they’ve taught their kids to ride bikes. But do they support continued dedicated funding for bicycling and walking programs like transportation enhancements, Safe Routes to School, and the Recreational Trails Program? That’s what advocates were trying to pin the offices down on. “If they say they support biking but they don’t support funding for these programs, they don’t support biking,” said one movement leader. 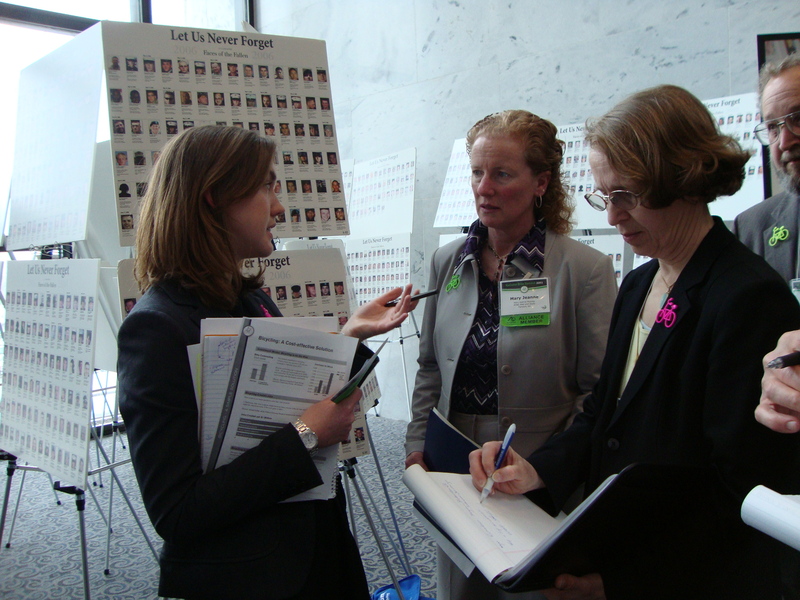 I sat in on several lobby sessions with Summit participants. New Yorkers told Senator Chuck Schumer about the growing enthusiasm for – and business of – cycling outside of New York City. They said bicycles provide the first- and last-mile connectivity for transit, filling in gaps that a bus network could never fully cover. They showed charts illustrating that cycling rates go up — and fatalities go down — with new infrastructure. They said bikes (and bike lights) are critical for people trying to get off welfare who get jobs on the midnight shift when buses aren’t running. They let the staffer know that under the president’s proposal, bicycling will fall under the category of “livability,” and they want Senator Schumer to support the funding levels Obama proposed. The Virginia group encouraged the freshman Republican Robert Hurt to be a “hero” in his district. They told his aide that with gas prices rising, they hear people saying, “I’d love to ride my bike for health reasons, for transportation — but I feel like I’d get killed on the road,” and they want to make sure new cyclists can go out with confidence. They said bicycling was a “back-to-basics” solution for health and fiscal problems: “It’s simple and it’s cheap.” They said transportation enhancements are a tiny percentage of the federal program and they more than pay for themselves. Teenagers from Philadelphia spoke to the entire Southeastern Pennsylvania delegation about their Neighborhood BikeWorks program that teaches kids how to work on bikes and eventually earn one of their own. Cyclists listened as Oklahoma Senator James Inhofe’s aides tried to convince them that although their boss tries at every chance to strip federal bike funding, he’s really not against bikes. Hoosiers sought clarification from an Indiana member who had said in a field hearing that bikes shouldn’t qualify for federal transportation funding. Oregon Senator Ron Wyden spent a half hour of his own time with his constituents, repeatedly asking what he can do to help cyclists. Did Schumer’s office address the Senator’s efforts to get rid of the excellent bike lane in front of the Senator’s Brooklyn home? The cyclists decided to keep to a national focus and not ask about city-specific issues. Also, staffers aren’t on the record in these meetings, so I didn’t quote any of them. Hey I’m the kid with the glasses in this, are there no better pictures of me? Haha. Btw. This was an amazing experience. Since the future of cycling worldwide hangs in the balance on Mr. Schumer’s street, I think it would have been wholly appropriate to ask. Which States Do the Most (and the Least) to Support Biking and Walking?